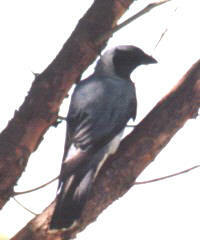 Black face with grey upperparts. Tail is tipped with white. Found in all parts of Australia. Found in open woodlands and forests. Yet another example of birds in Australia being named for overseas birds that supposedly resemble but are not particularly closely related to. Cuckoo shrikes are neither cuckoos nor shrikes. The 'Cuckoo-shrikes' are found throughout the Old World tropics and are called 'wing-shufflers' in Asia due to their habit of refolding their wings when they alight. The metallic trills of the 'Barred Cuckoo Shrike', Coracina lineata, can be heard the coastal lowland rainforest, such as around Mossman Gorge. The metallic trills of the 'White-bellied Cuckoo Shrike' can be heard the coastal lowland rainforest, such as around Mossman Gorge. This species is a pale grey and cream bird with a black eye stipe, and can also be common around human habitations in the region.